So everybody coming to Paris knows of the Jardin de Luxembourg, Jardin des Tuileries and the Champ de Mars (home to the Eiffel Tower), right? What about the Parisians? Surely they do not want to be swamped by tourists in those well known places. So where might they go to be 'far from the madding crowds'? I also believe that many young women can at times become bit of a target when they are in a park alone. 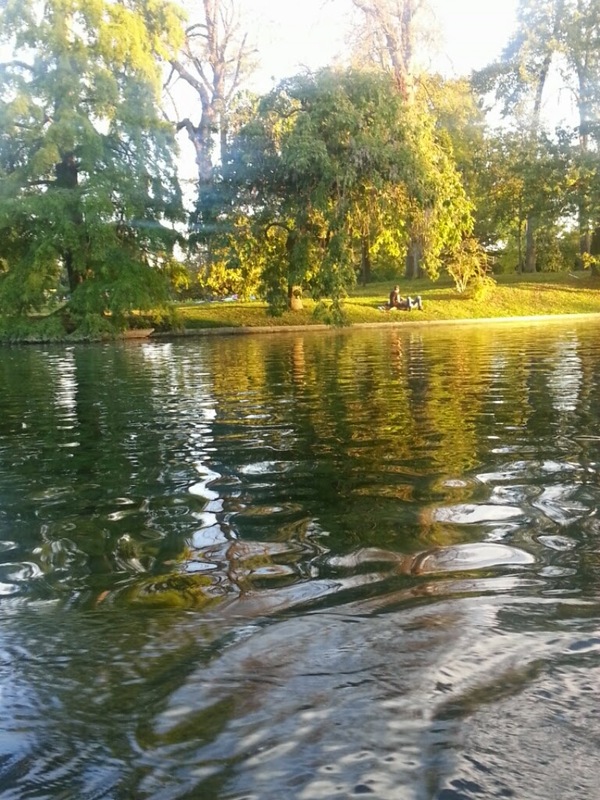 Towards the end of summer 2014, I was continuously bothered whilst sitting reading in the Tuileries Gardens and the Luxembourg Gardens trying to enjoy some peace and sunny weather. The most impressive thing about this sizable green space is that it is man-made. 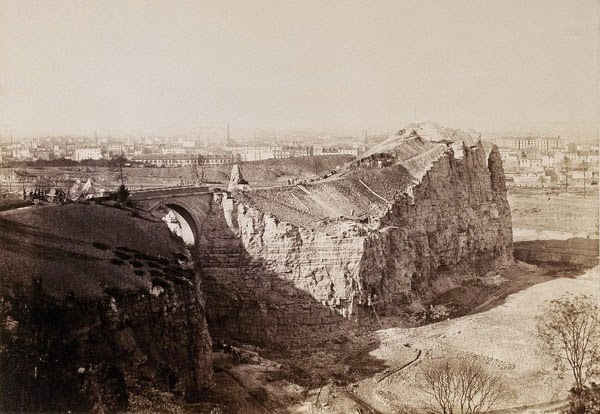 In fact, it was historically a quarry in a neighbourhood that has been more working-class. However, much has changed. 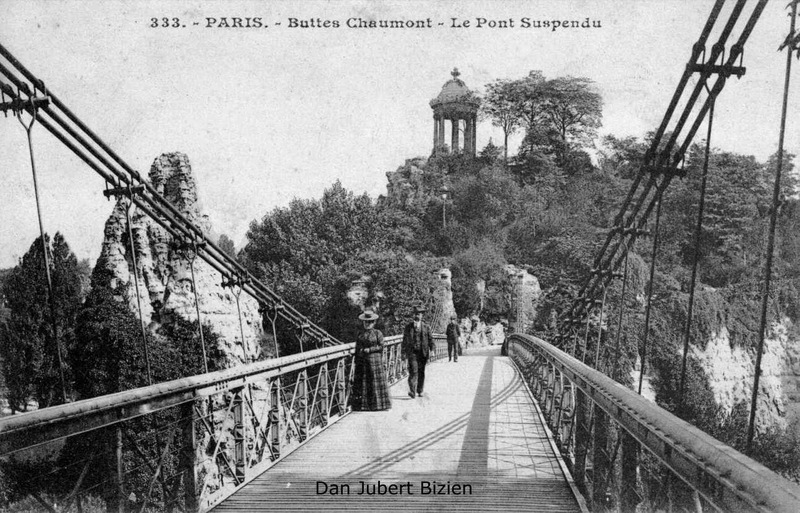 I have spent so much time at the Parc Buttes Chaumont over the years and it is a place where you have the freedom to really relax or do whatever you please. It is obviously very hilly and attracts residents from all over the city, from all walks of life. Here you will find many partaking in tai chi, yoga, meditation, martial arts,etc. I have always been somewhat envious or perhaps more in awe of all the people going for their runs. This may be due to my own fitness limitations and the fact that the park is so darn hilly!!!! Sometimes there are some locals who start a little sing-song in the park. There is also many places in the park with fitness equipment that seem to always be utilised by someone. 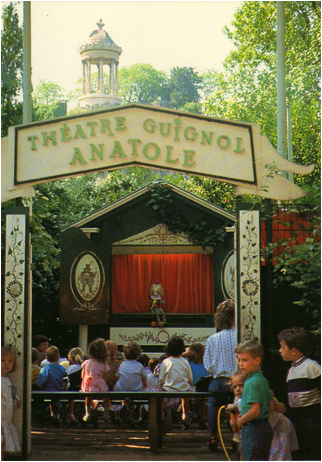 The famous Polichinelle and his wife, known best in England and anglophone countries as the quarrelling Punch and Judy can be found at the Theatre Guignol Anatole. It has been there in the park since 1892! So it has been entertaining children here for a long time. Rosa Bonheur is the park's cafe. Food is not served there, only drinks. 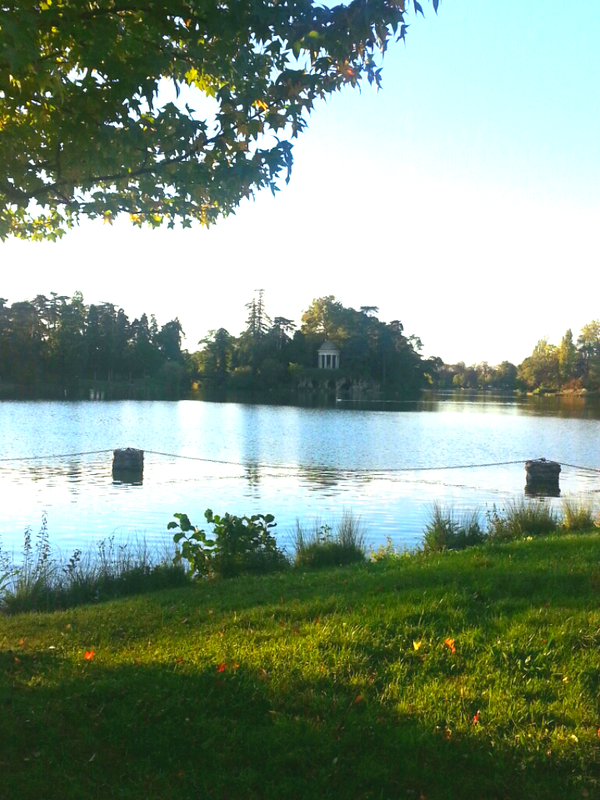 Parc de Belleville is one of those underlooked parks, although full of locals, not so well-known otherwise. 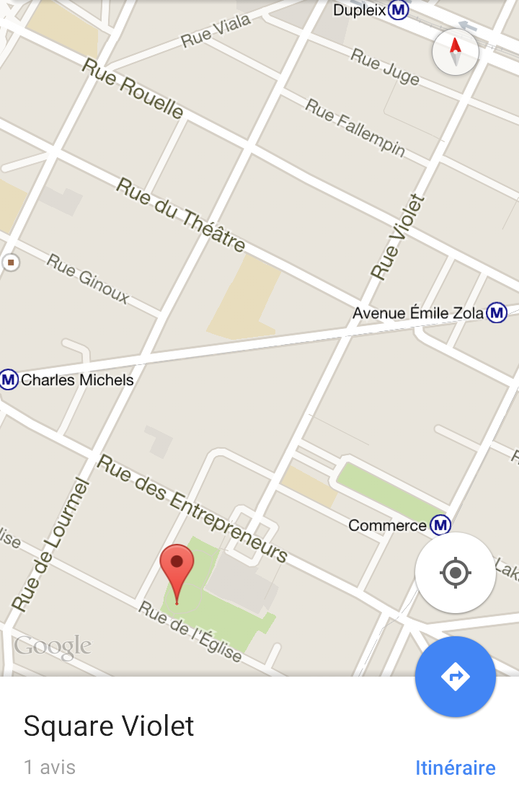 It is near the 'Belleville' metro station. The neighbourhood is a bit of a Chinatown and 'Oriental' area (Oriental means Arabic here, not Asian like it means everywhere else). Some great shops and cool bars in this area! It is located uphill and if you continue up the steps to the top, you have a lovely view over Paris and the Eiffel Tower. There is also a nice cafe and boulangerie at the top. There are also playgrounds for children and the grass is often covered in people during the warmer months. I was here talking on the phone sitting on a park bench last October watching two older Asian ladies- one was climbing the apple trees and throwing shiny red and green apples onto the ground and her friend was filling them into bags. They were doing this and yelling at each other as I saw two park guards walk up the path. They stopped with bewildered looks on their faces. "Qu'est-ce que vous faites-là?" one of the guards asked. Basically meaning "Err... what are you doing?" The lady on the ground appeared surprised at being spotted by someone of authority. She was not able to respond well in this situation. I am not sure about the language being the barrier or just the whole situation being a bit too embarrassing. "Prier de ne monter dans les arbres, Mesdames. Si vous devez faire ca, ramassez-les de la sol"
"Please don't climb the trees, ladies. If you must, take some from the ground". The second lady climbed slowly down from the trees and they nodded at the men. They continued to pick up a few more apples from the ground and then made their way down the steps to leave. The guard looked up at me sitting there on the bench, gave a wink and we both laughed. "Si vous aimez les pommes aussi, il y a en plus!" Practicalities: Metro Belleville, ligne 2. Follow the signs from the exit to the park. We came to the Bois by metro 'Porte Dauphine' on line 2 because I wanted to stop via the house where Olivia de Havilland lives in the 16eme as I love my classic movies. Standing in front of her hôtel particulier, I was quite struck at being so close to someone who has touched so many people since the Golden Age of Hollywood- one of the last remaining symbols of that era after the death of her sister, Joan Fontaine and of Lauren Bacall over the past year. Aged 98- what a legend! 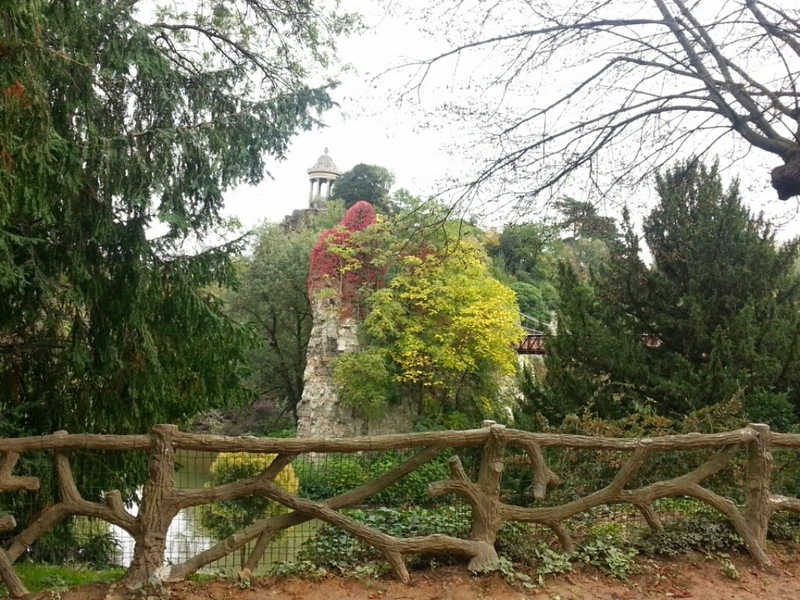 It took time to walk to the Bois de Bologne and we had to cross many busy roads. We finally saw the signs after escaping death a few times running like scaredy cats dodging the traffic. Note: Traffic in Paris- no, make that...France- can be quite eye-opening. Remember those 'zebra' crossings do not mean you have right of way as I discovered as an 11 year old girl visiting Paris for the first time with my dad and having to be pulled out of the way from an oncoming car that had no intention of stopping for anyone. P.S Don't get me started on traffic in Korea... ha. My friend is from Canada and lives near lakes and forests so naturally was not as impressed as the girl from suburban beachside Melbourne as we started our walk deeper into the woods. We hired a rowboat for an hour. We needed a deposit of 50 euros in addition to the hire fee, which was 10 euros. Luckily we had cash as they do not accept cards and there was a lengthy queue on such a lovely day. Like many places though, they accept cheques from a French bank. There was Brazilian music playing in the Bois that we could hear as we glided by in our rowboat. It also seems that I am not very skillful when it comes to rowing a boat for the first time. So after the second awkward "let's hang on to the side of this embankment and hope to good God that neither of us fall in while trying to swap positions in a rowboat" scenario, my friend took up the dubious honour (aka had absolutely no choice if we were to return home ever). Please note: Bois de Boulogne has a reputation for prostitution after dark so be aware of this especially young women. Can get a bit 'dodgy' and have heard stories from friends of incidents where pimps have mistaken sightseers as girls who are taking over their 'area' and been hurt- this being at nightfall. This is a more extreme example and not during the day. I came here with a friend from New York who had been living and studying a Masters in London before coming to Paris as an English teacher like me. She had also lived in Nantes (and Paris on exchange) a few years earlier and had an undergraduate in art history and French, so is familar with life in France. She had not been to Bois de Vincennes before either but had explored Bois de Boulogne in the past. We met at metro 'Porte de Vincennes', which is the end of line 1 (yellow) and grabbed a few refreshments from the local shops. We, unfortunately are a little bit; how do you say... 'directionally- challenged' so ended up popping into the information shop next to the supermarket and they pointed us in the right direction. The lady also gave us a nice little illustrated plan, which we I admit, huddled around and folded up in all sorts of ways like it was a compass while we wandered around (amongst giggling) later in the bois trying to find one of the lakes in particular. 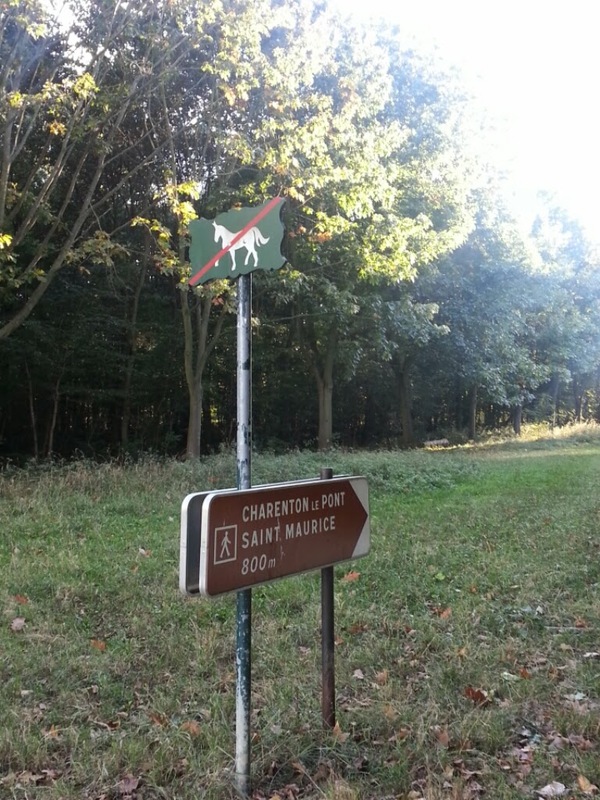 To get to the Bois, you need to walk past the Château de Vincennes and cross a couple of busy roads again. 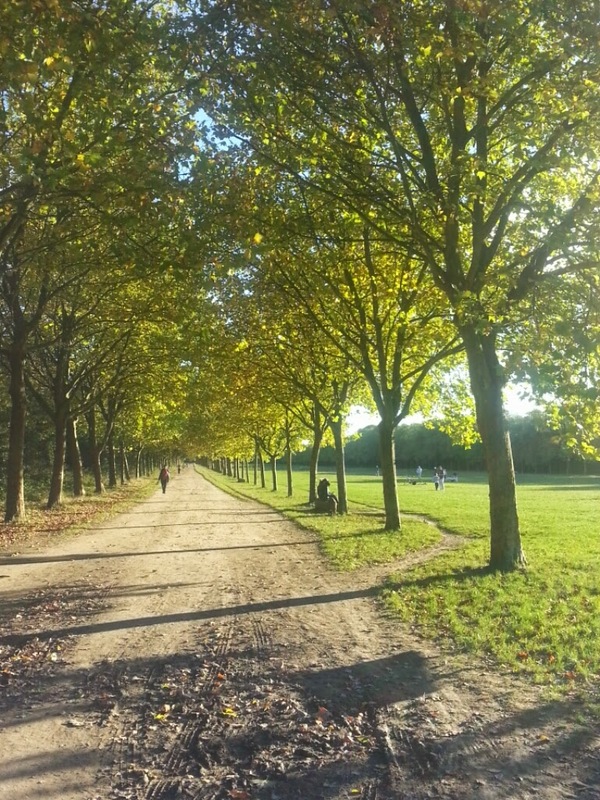 Bois de Vincennes, like Bois de Boulogne is located on the outskirts of Paris, still joined by the Paris metro though rather than the RER. Took this photo whilst sipping a beer with a friend on a park bench at sunset. This guy was fishing. 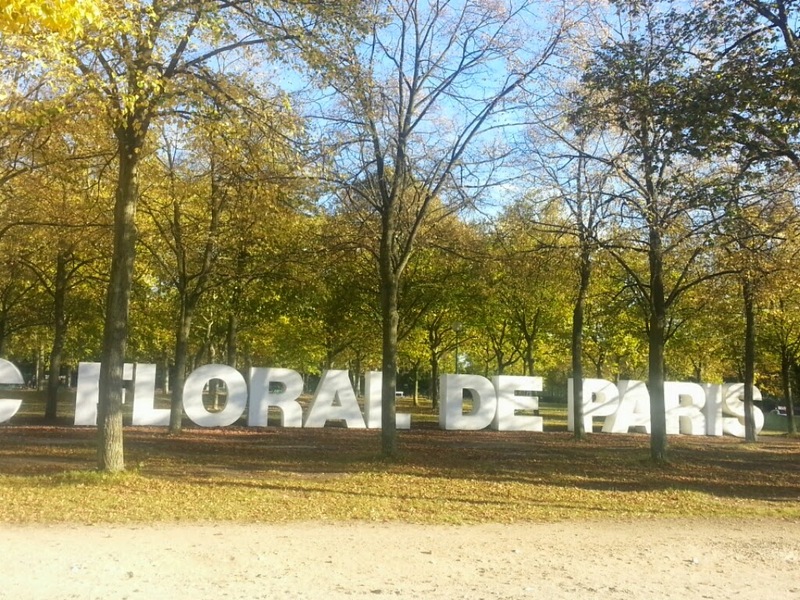 Park Floral de Paris is located on one end of the Bois de Vincennes. 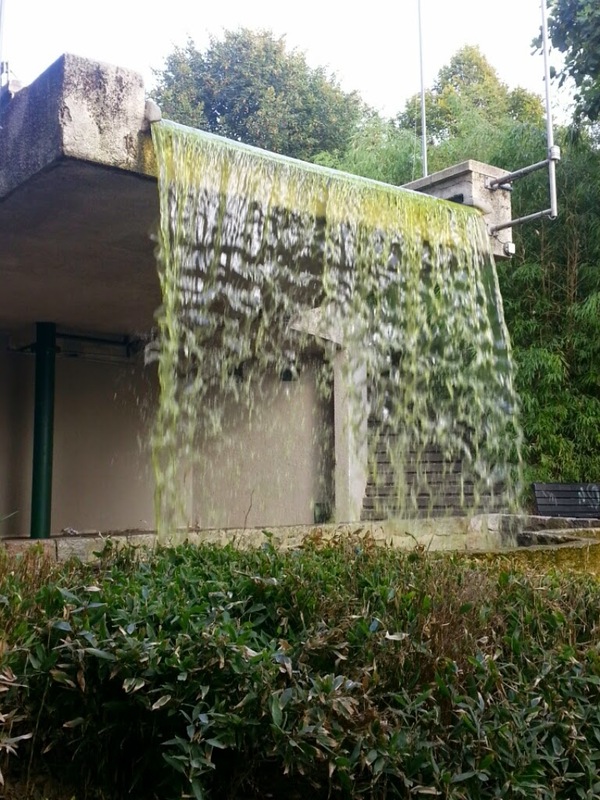 The Parc Floral de Paris is a separate park, which holds free concerts in summertime. 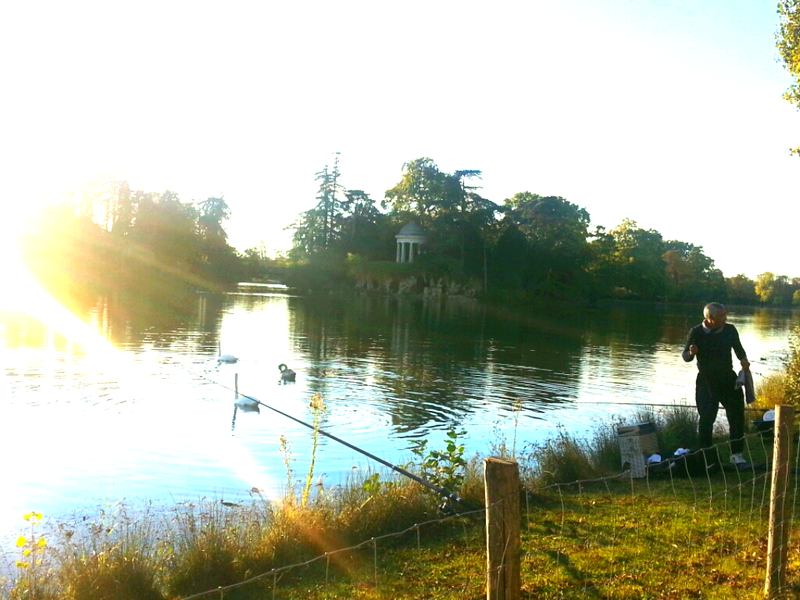 In 2012, we had a picnic on a grassy nole overlooking a lake whilst listening to classical music. 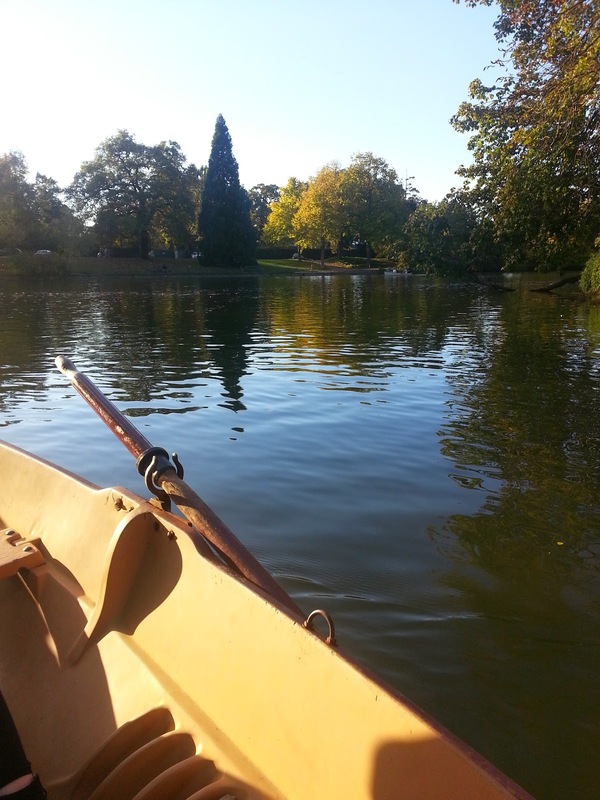 You can also hire rowboats like at Bois de Boulogne. Ok, so this one is particularly more random. Personally, I love the Square Violet in the 15th arrondisement. It was my local neighbourhood in 2010-2011. 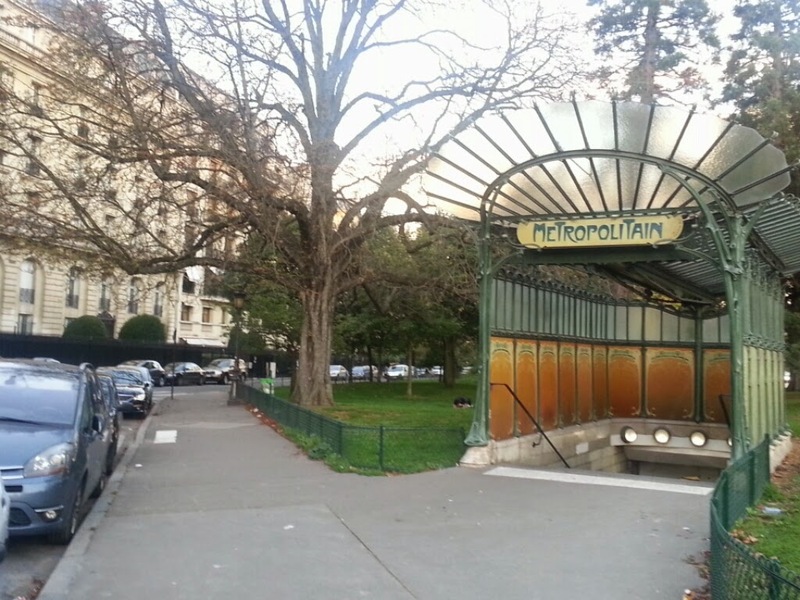 I only discovered the park shortly after moving into my apartment located on rue de Lourmel. Unfortunately, I did not have an internet connection at the time of demenagement. It would be three weeks before it was sorted out by my landlord. So I went for a wander around in search of a park, as Paris Wifi is present in most via Orange. And there I would Skype my family back home in Australia. One day I was tapping away on my laptop doing something or other and then there was music. Musicians started playing traditional French music and then there were couples dancing to it on the gazebo in the park.